Be the first to share your favorite memory, photo or story of Dortha. This memorial page is dedicated for family, friends and future generations to celebrate the life of their loved one. Dortha Mae Alexander, 88, of the Solway Community, passed away Wednesday, November 14, 2018 at her home. She was born May 24, 1930 in Loudon, TN, the daughter of Bert and Myrtle Brackett Shirk. Mrs. Alexander was the owner of Unique Hair Fashions of Oliver Springs for forty years. She was a beautician for over sixty years, a profession she loved, and only retired due to problems with her eyesight. 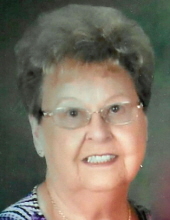 She was a member of Solway Missionary Baptist Church and bowled for many years with the Oak Ridge Bowling League. In addition to her parents, she was preceded in death by her husband, Paul Alexander; brother, William S. J. “Dub” Shirk and wife Geneva; sister, Anna Watkins and brother-in-law, William Watkins. She is survived by daughter, Nancy Winchester and husband Danny; son, Paul Anthony Alexander; her beloved canine companion, Emmie and a host of nieces, nephews, cousins and extended family. The family would also like to recognize all her loyal customers from over the many years that she became close to and considered her second family. The family will receive friends on Friday, November 16, 2018 from 6 – 8pm at Weatherford Mortuary. The funeral will follow at 8pm with Rev. Logan Parton and Deacon Bill Hurst officiating. Family and friends will meet on Saturday at 10am at Oak Ridge Memorial Park for a graveside service. Flowers are appreciated or any memorials can be made to Solway Missionary Baptist Church. An on-line guestbook can be signed at www.weatherfordmortuary.com. To send flowers or a remembrance gift to the family of Dortha Mae Alexander, please visit our Tribute Store. "Email Address" would like to share the life celebration of Dortha Mae Alexander. Click on the "link" to go to share a favorite memory or leave a condolence message for the family.